The foreign military forces that filled Egypt’s main cities in the post-World War II era brought about many changes in the local entertainment culture. Many nightclubs were opened and musicians, actors and dancers – both male and female – took advantage of the tremendous thirst for entertainment, which they were more than happy to supply. The big stars of Helmieh Palace were “The Jamal Twins -” belly dancers who introduced a new style into this ancient style of eastern dancing. 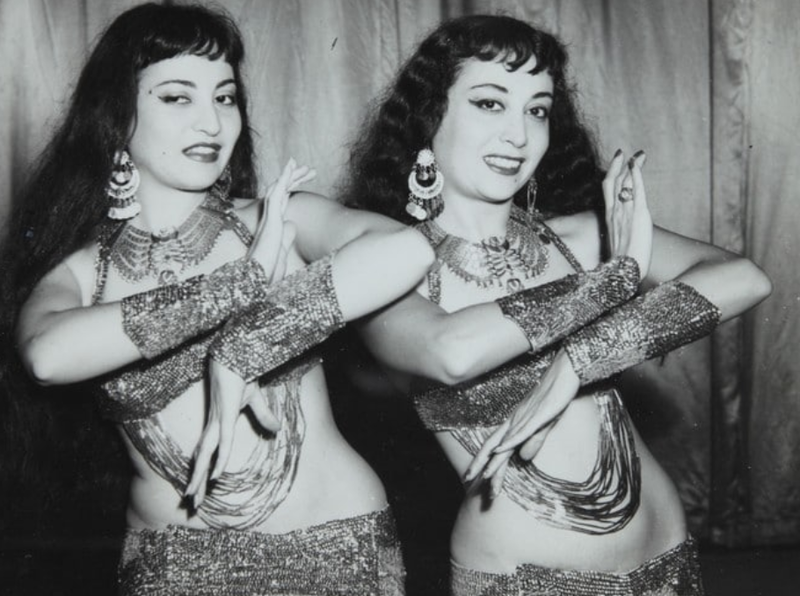 The sisters, Leila and Lamia, became the foremost stars of the Egyptian entertainment world at the end of Farouk’s regime. Their audiences were always packed and the Egyptian king was one of their greatest admirers. What was the magical secret of these girls that launched their star studded careers? The Mediterranean Sharkiya dance was one of their specialties. The musicians who accompanied the pair practiced with them for hours at a time to match the choreography to the musical repertoire, which was carefully selected. Grueling practice sessions, endless exercises and daily rehearsals produced extraordinary results. The Jamal sisters’ performance was bright and innovative; the two dancers moved in wonderful harmony, with the dance and the music completely in sync. Their dance performances, in which they also used various stage props, was not simply another exotic oriental dance. They knew how to create a symmetrical picture of movement and make it virtuosic, while vibrantly expressing the music they moved to. The connection between them and the musicians was lively and exciting for the audience. The Jamal sisters’ musical talents were wholly unsurprising. They were daughters of musicians and had learned to play instruments from early childhood. Their father, Fishel Alpert was a violinist in the Vienna symphony orchestra. His name reveals his origins as a Jew who had moved from Chernowitz to the Austrian capital, where he became a professional musician. The reason for his emigration in the 1920’s to Egypt is unknown. It could well have been the great economic crisis which propelled him far away from Europe, to a place where he would have a dignified position in an orchestra and a decent income. In Alexandria, Fishel met his wife, Jini (Janin) Elpert. The impressive presence and the beauty of this opera singer, the daughter of Jewish emigrants, captured his heart. Their firstborn daughter, Helena, was born just a year after their wedding and her younger sister, Bertha, was born two and half years later, in 1932. What was the status of Judeo-Arabic in Iraq?